Weight gain and obesity are increasingly common conditions in the United States and the Western world. The causes of being overweight are mostly an imbalanced diet, lack of exercise, genetic conditions, endocrine and hormonal imbalances, and stress. Research has shown certain medications including corticosteroids, anti-depressants, and seizure medicines can cause undesired weight gain. Body Mass Index, or BMI, is used as a screening tool using a person’s height and weight measurements. A normal adult BMI is 18.5 to 24.9. The range for overweight is 25-29.9, and over 30 is obese. Obesity is a serious medical condition that can cause both physical and mental complications such as high blood pressure, atherosclerosis, heart disease, diabetes, sleep apnea, high blood cholesterol, back and knee pain, anxiety and depression. In conventional Western medicine, treatments include lifestyle changes such as heart-healthy eating, increased physical activity, and FDA-approved weight-loss medicines. For some people, surgery may even be a treatment option. In Chinese Medicine’s perspective, physicians look at weight gain and obesity from a different perspective. Written over 2000 years ago, a Chinese classical book of medicine <黄帝内经>, Yellow Emperor’s Canon Internal Medicine, documented the theory of undesired weight gain. It says, “generally, the food enters through the mouth, stores in the stomach, converts into the refined substance by the spleen which is transported to various organs. However, if the spleen fails to operate normally and the up-flowing of the body fluid will cause sweetness in the mouth. This disease is seduced by the fine and delicious food, and most of the patients with this disease usually have nice and delicious food. The fatty and delicious food can cause the inner heat for a man, and the sweet taste can cause one to have fullness and distention of the chest. And the up-flowing of the spleen energy may be transferred into diabetes. It should be treated with stem of the orchid which can remove the staleness heat.”(translation by Nelson Liansheng Wu, Andrew Qi Wu). In short, failure of the spleen system’s transportation and transformation and stomach heat is the blame for weight gain, and subsequent development into diabetes. In modern Traditional Chinese Medicine (TCM), there are two additional causes for being overweight: phlegm damp accumulation, and spleen and kidney yang deficiency. 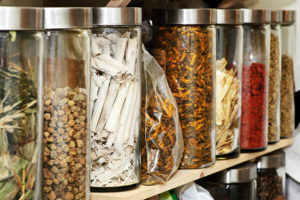 Research has shown the effectiveness of Chinese herbs in weight loss. It works internally with digestive accumulation by speeding up metabolism and expelling water, and regulating the endocrine system for appetite control. Its gentle yet long-term effectiveness has been recognized by many health professionals. Let’s study the clinical manifestations individually. 1). Stomach heat syndrome (胃热滞脾证). This organ syndrome usually manifests in a huge appetite, abdominal distention, red complexion, foul breath, constipation and acid reflux, dry mouth and bitter taste. Formulas such as Ping Wei San（平胃散）and Fang Feng Tong Sheng San（防风通圣散） are the top choices to rapidly reduce appetite, cool down the digestive system, and eliminate waste through the bowels and perspiration. If the person has a strong body type and suffers from constipation, the Chinese herbs Da Huang, Zhi Shi and Hou Po can be added to the formula to enhance the detox effect. 2). Spleen system failure to transport and transform (脾虚不运) 。In contrast with Stomach Heat, this syndrome usually shows as a poor appetite, abdominal bloating with little food intake, limb puffiness and heaviness, frequent urination or dysuria, loose stool, spontaneous sweating and general fatigue. The treatment principle is to tonify or nourish the spleen and expel excess water. The representative formula is Fang Ji Huang Qi Tang (防己黄芪汤). The main function of this formula is reducing edema through urination and improving energy. For extreme edema, add Yi Yi Ren, Da Fu Pi and Dong Gua Zi. Wu Ling San (五苓散) can be added if there is urine retention. 3). Spleen and kidney yang deficiency (脾肾阳虚). Symptoms here are very similar to the previous one, except with more puffiness on the body, even on the face, watery stool in the morning with indigested food particles, aversion to cold, shortness of breath, wheezing with slight movement and frequent nocturia (nighttime urination). The representative formula for this syndrome is Zhen Wu Tang (真武汤). If the person has more body coldness, add Bu Gu Zhi, Xian Mao, Rou Gui and Fu Zi. A formula called Jin Gui Shen Qi Wan (金匮肾气丸) can reduce the frequency of nighttime urination. 4). Phlegm damp accumulation (痰湿内盛) . Clinical manifestations of this syndrome usually are undesired weight gain, body heaviness, shortness of breath and chest tightness, phlegmy coughs worse at night, dizziness, dry mouth without thirst, and tiredness. A group of herbs such as Shan Zai, Jue Ming Zi, Lai Fu Zi and Ji Nei Jing have been proven to remove adipose (fat) cells ( “invisible phlegm” in TCM) and reduce cholesterol levels. Chen Pi, Gua Lou and Xing Ren can help loosen up the lung phlegm thus reducing cough and chest tightness. Further, after successfully losing weight with acupuncture and herbs, it is important to remember that weight management requires lifestyle changes. These include mindfully selecting food and exercising. Formulas such as Xiao Yao San (消遥散) can prevent stress eating and food cravings. Also, creating a good sleep pattern can also help with anxiety and stress to reduce cortisol levels, thus preventing stress eating. Each person has different body type, metabolism and social environment, therefore treatments will differ greatly even with similar symptoms. One should discuss their case with a licensed acupuncture physician who is specially trained to prescribe the proper herbs and treatments tailored to one’s individual weight management needs. Dr. Dongfeng Zhou is a licensed and skilled acupuncturist at our Margate / Coral Springs / Coconut Creek acupuncture clinic that can help you reach your weight loss and health & wellness goals. Consultations are free so get started today!